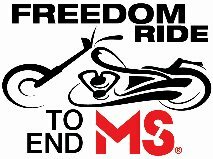 Register now for the 3rd annual Freedom Ride to End MS, presented by Freedom 55, for your chance to win a 2012 Harley Davidson Iron! Riders and passengers must each raise a minimum of $50 in pledges to participate in the ride. Your participation includes a free continental breakfast, a Ride Day T-Shirt, Goodie Bag, lunch, a raffle ticket and a full afternoon of vendors and attractions. Each additional $50 in pledges will earn you one more draw ticket. The more you raise the closer you get to winning the Grand Prize! Register online or before August 24th, 2012 and receive another raffle ticket for the Grand Prize!